Having your carpets cleaned is a chore that usually falls into the same category as spring cleaning: not very fun to do but necessary, and should occur at approximately the same level of frequency. Most carpet owners, however, will only have their carpets cleaned once every few years (and some not even that). Carpet cleaning is not just important for removing stains. Having your carpet cleaned will improve and prolong your carpet's performance. To keep your carpet looking and performing well for as long as possible, manufacturers recommend having your carpet cleaned at minimum every 12–18 months, depending on the amount of traffic in your home. In fact, such frequent cleaning is a condition of many warranties—be sure to carefully read your warranty information. While regular cleaning is important for all types of carpet, it is especially true in the case of nylon carpeting. Nylon contains a hydrogen molecule. This is the primary source of nylon's resiliency. When the fibers have been flattened down due to foot traffic, cleaning reactivates the hydrogen molecule, causing the fibers to literally bounce back. The cleaning will actually revive the carpet and enhance performance. Hot Water Extraction and So-Called "Steam Cleaning"
The method of carpet cleaning recommended by most carpet manufacturers is hot water extraction, which is more commonly (though slightly incorrectly) known as steam cleaning. 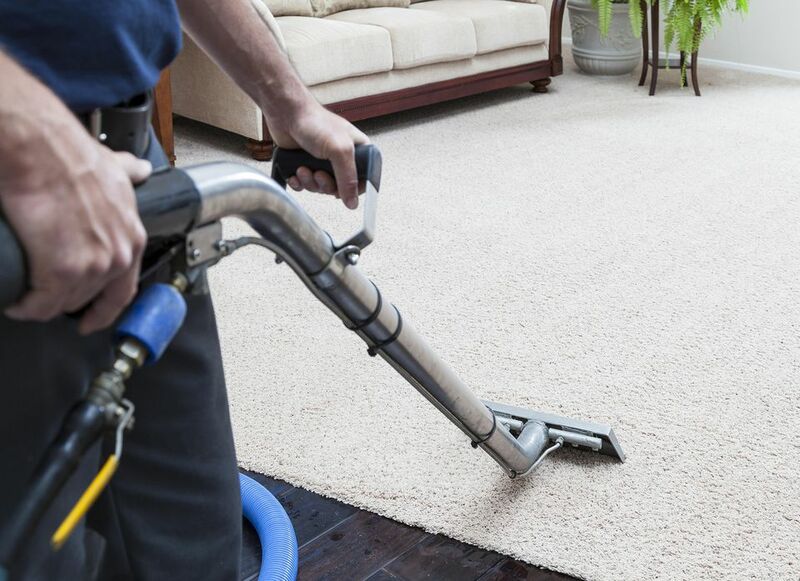 In the hot water extraction method, hot water is essentially sprayed on the carpet and then sucked back into the machine, along with any dirt that was on the carpet. There is usually a cleaning solution added to the water to assist in the removal of stains and soiling. Professional cleaners may use either a truck-mounted unit or a portable machine. The portable machine has obvious benefits, such as being able to be used in apartment and condo buildings in units that would otherwise be beyond the reach of a truck-mounted unit's hose. However, truck-mounted units are more powerful than portable units and should be used whenever possible for maximum efficiency. There is an abundance of do-it-yourself (DIY) steam cleaning machines available for either rent or purchase. With so many different machines on the market, it can lead you to wonder if you should skip calling in the professionals and just tackle the job yourself. If your household is prone to spills or accidents that are difficult to clean, a small cleaner may be a worthwhile purchase to have on hand. However, for more general cleaning of your entire carpet surface, it's highly recommended to have a professional come to do it. When properly done, the carpet should be only slightly damp after it has been thoroughly cleaned. Wet carpet indicates that the machine was not powerful enough to do the job effectively. If your carpet is very wet after cleaning, use fans to speed up the drying, and be sure to stay off it until it is dry. Do not replace the furniture before the carpet is completely dry. Other variables—such as the amount of cleaner added to the machine and the technique for using the machine i.e. how fast/slow to move across the carpet—present several opportunities for things to go wrong with DIY machines or at least not as well as with professional cleaners. If you are concerned about the cost of having a professional come to clean your carpets, consider having only the "traffic areas" cleaned. This means that your big pieces of furniture, like the sofa, bed, etc., are left in place and the cleaner simply goes around them. Not only do you not see the carpet under these large pieces of furniture, but it is not exposed to the air, light, and foot traffic the way that the rest of your carpet is so it makes sense that it does not require cleaning as often. Of course, if you frequently move your furniture around, it would probably be best to have the entire surface cleaned. Having only the traffic areas done should save you some money versus cleaning the entire area.